It has been reported nationally, that important remains of an important Roman villa have been discovered at a farm in Wiltshire. High quality mosaic work apparently gave the game away when excavation for underground electrical cables was started and then rapidly abandoned as Historic England was called in to investigate. And what specifically caught my attention in this report? The land owner was rather taken, not only by the mosaic flooring in what was a vast villa complex, but by the oysters consumed at the site. “We have found discarded oyster and whelk shells. To keep them fresh, they must have been brought in barrels of salt water from the sea, which is miles away, and that shows just how rich the villa’s owners must have been." 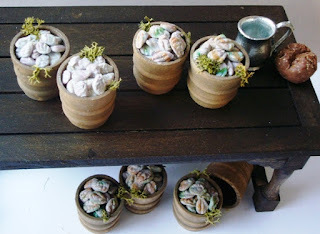 MedievalMorsels food, one inch scale shellfish. Tub of oysters. Britain was renowned for its oysters even after the Romans had left Britain in the 5th century AD. They continued to be imported by the Romans to Rome. Moving forward to medieval times the oyster is one of the first foods modelled for the 12th scale period dollshouse by MedievalMorsels. According to Annette Hope's book "London Larder" in 1298 oysters were two pence a gallon, which was the price charged by medieval cooks to roast a goose. In the 1660s English travellers compared Venetian oysters with those from Colchester (back in England). Colchester was a very important Roman garrison town so perhaps the Romans' appreciation of English oysters first developed here. I do not know if oysters are still thriving in Colchester, but I rather doubt it! The oyster was a favourite of medieval cooked dishes - in sauces, stuffed into for meats and baked in pies. The famous English diarist Samuel Pepes bought them in even larger quantities- by barrel load - either for himself or as presents!